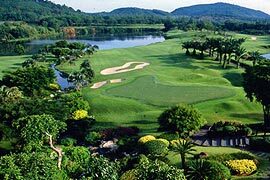 Blue Canyon Country Club has been rated as one of the most prestigious golf clubs in Asia, with two stunning, award-winning championship courses on its 700+ acres of succulent valley seamlessly winding its way through rubber plantations and tin mines. The rigorous Canyon Course remains renowned for hosting the Johnnie Walker Classics Tournament twice and offers a challenging and rigorous game while the visually stunning Lakes Course promises magnificent views of the dramatic natural vistas while enjoying a more relaxing round. Driving ranges, practice putting greens and lessons from professional golfers are available at both courses, with a Pro Shop carrying the top brands of gear and apparel within the club facilities. The common club house offers a full range of world-class amenities including sauna, Jacuzzi, massages, restaurants and 32 fully equipped rooms for those opting for the convenience and luxury of the 'Stay and Play' packages.